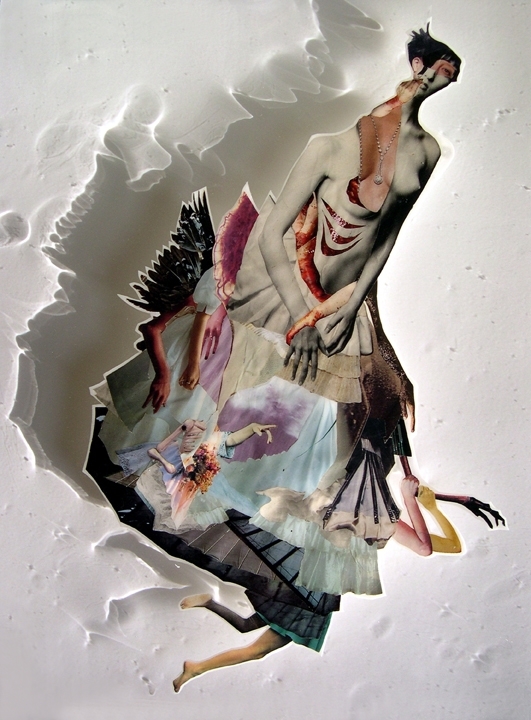 Bride to Be, 2011, Hand-cut and assembled photographs and found images, cast in plastic resin. Framed. 16 X 20"
Claria, 2011, Hand-cut and assembled photographs and found images, cast in plastic resin. Framed. 25 X 20"
Child Bride Makes Friends with Her Shadow (original study), 2009, Hand-cut and assembled photographs and found images, cast in plastic resin, 20 X 24"
Glory, 2011, Hand-cut and assembled photographs and found images, cast in plastic resin. Framed. 20 X 25"
Work Horse, 2011, Hand-cut and assembled photographs and found images, cast in plastic resin. Framed. 16 x 20"
Lip Locked, 2011, Hand-cut and assembled photographs and found images, cast in plastic resin. Framed. 28 x 38"
Waiting, 2011, Hand-cut and assembled photographs and found images, cast in plastic resin. Framed. 24 x 30"
Stain, 2009, Photographs and found images cast in plastic resin 16 X 20"
Waylay, 2011, Hand-cut and assembled photographs and found images, cast in plastic resin. Framed. 20 x 16"
Te Wolf, 2012, Hand-cut and assembled photographs and found images, cast in plastic resin. 16 X 20"
Twins (go team), 2009, Hand-cut and assembled photographs and found images, cast in plastic resin, 16 X 20"
Good Dog, 2010, Hand-cut and assembled photographs and found images, cast in plastic resin. Framed. 16 X 20"
Constrictor, 2010, Hand-cut and assembled photographs and found images, cast in plastic resin. Framed. 16 x 20"
Patience, 2010, Hand-cut and assembled photographs and found images, cast in plastic resin. Framed. 11 X 14"
Sweet Pea, 2011, Hand-cut and assembled photographs and found images, cast in plastic resin. Framed. 11 X 14"
Cats Craddle, 2011, Hand-cut and assembled photographs and found images, cast in plastic resin. Framed. 20 X 36"
Faithful, 2011, Hand-cut and assembled photographs and found images, cast in plastic resin. Framed. 20 x 30"
Showoff, 2011, Hand-cut and assembled photographs and found images, cast in plastic resin. Framed. 20 x 30"